Now there’s a really easy way to make great live sound, thanks to Soundcraft’s new integrated mixer/amplifier GigRac. Whether you’re a solo performer or a in small band, you’ll appreciate not only GigRac’s cool, stylish looks, but also its portability, and the ease with which you can connect your microphones, instruments and loudspeakers to deliver a punchy performance every time. 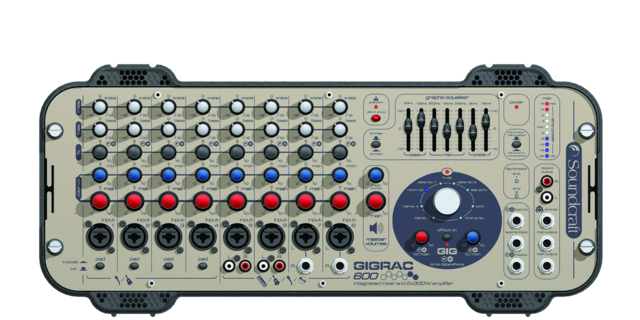 GigRac comes from Soundcraft, the name behind the live sound mixing consoles used on many of the world’s major tours and festivals, so you can be sure that the sound quality is going to be absolutely staggering. GigRac makes it easy to set up your own PA, needing just speakers and cables to complete the system. Get from mic or guitar to a great sound in no time at all. Everything you need is provided, from high-quality mic preamps to make your voice clear and effective, a great sounding 2-band EQ to cope with demanding sources, a 7-band graphic EQ designed by professional audio industry leaders BSS Audio, and a selection of preset digital effects to give you major stage presence, and all this in a drop dead gorgeous package that you can carry over your shoulder.